I must admit I often neglect to dress up my outdoor space with fabrics. 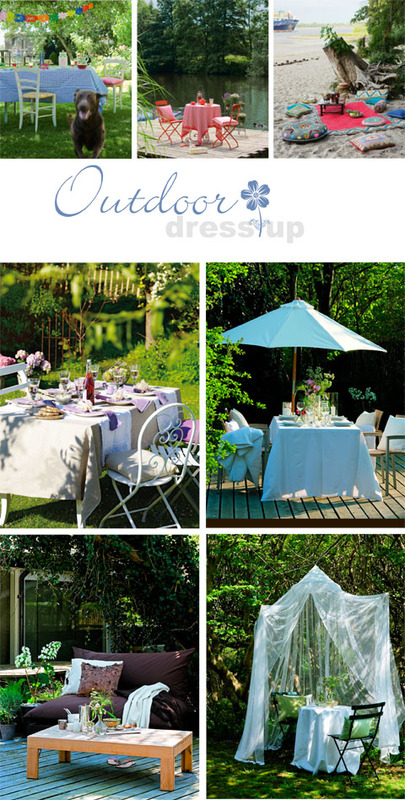 It's such an easy way to give a tired outdoor setting a fresh summer look. My balcony is in desperate need of some nice soft furnishings and my project for this coming weekend is to sort through my stash of cushion covers and fabrics and liven up my small outdoor area. I am absolutely pining for a big garden and often feel that I will never get used to apartment living. I am a county girl at heart and having my own green space is important, but since having two active little boys it has become almost essential. We'll be moving out of our apartment (and back to New Zealand) at the end of the year and until then I am determined to make the most of it - it has so many wonderful aspects and it's true what they say: "the grass is always greener..." when I do have a great big garden one day I will probably think back at how carefree apartment living was. Longing for our garden if I see this. This weekend it will be warm again, cannot wait to go outside! I'm going to make some new outdoor cushion covers while we can still enjoy sitting outside. Love all these settings.